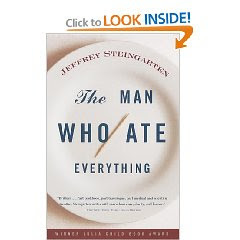 This is a book about man who eats food. A lot of food. As food critic for Vogue magazine, Steingarten talks about food the way some people talk about sports or shopping or family gossip. This book is merely his ode to gastronomy. He isn't just content to munch on bread in a restaurant, he tries for months to make his own perfect loaf. Same thing goes with ketchup. Hey, different strokes for different folks. While some may wonder how in the world someone could spend 500+ pages talking just about food, Steingarten deftly weaves in his travel experiences around the world and this makes for some very compelling passages. His thoughts on how our food prejudices were also interesting to read. Steingarten argues that babies are not really repulsed by any kind of food. It's only as they get older and see how their parents interact with food that determines what they will and won't eat. Overall, a pretty tasty read.